After doing Dr Joe’s meditations for nearly two weeks now, they are beginning to feel like part of my daily routine. Just like when you wake up and put the kettle on, I wake up and put Dr Joe on! Some days I have managed to feel such emotion I cannot stop the tears from flowing down my face even when the recording has ended, and other days I find I finish with a content smile. I’ve come to learn that some days I will connect intensely and others not so much, but that’s ok as you are only human. However regardless of the emotional response I have or not, I am still reprogramming my brain everyday, twice a day by seeing my life play out in my mind the way I always dreamed it would. After being blonde my whole life I decided that now more than ever was the time to make a change, a big one, which in the end became quite an emotional day. Well I thought, as I’m supposed to be creating a new me in habits, thoughts and beliefs, then why not change my personal appearance to reflect the beginning of this new me and the journey I am on. Plus I’ve always wanted to be a brunette but I’ve never been brave enough to go through with it, but this was the perfect time to embrace change. So……..Tad ahhhh! Meet the new Christie Jane! After an initial mild panic I have started to love my new locks and the new me! Secondly, I discovered this week that unfortunately eating raw cacao powder is not something that agrees with me, and I don’t say that lightly. It really, really doesn’t agree with me! The incredible pain I felt after consuming this took me back to my darker days. 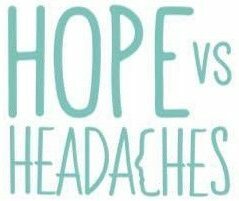 As my recovery has progressed, the only way I can describe my migraines changing is that the intensity behind them has weakened. It’s almost like they are loosing their power to fight me nowadays. Well, until this one, which was how I would imagine being hit by a double decker bus in the back of your head would feel like! With both migraines I took my usual Triptan on the onset day, however literally the next day I was back on my feet and even managed to go for a coffee and wander around the shops with my Mum for a few hours. I cannot explain to you in words just how unbelievable this is for me!!! Talk about progress, I couldn’t believe it myself but it was true! Just two days from start to finish and I was completely back on track! No visit to the Chiropractor needed at all. How could this be possible? I just knew Dr Joe’s meditations were reprogramming my brain to alter the beliefs that I have had for such a long time such as “every migraine lasts about a week”. If I could have a migraine and recover in just two days then anything is possible! Apart from the migraines this week I had some really good days, and when I say good, I mean really good! The kind of “normal person” days I call them, whereby you haven’t slept that great but you still see friends, go for coffee, attend appointments and not once think about getting a headache kind of day. That for me is a level of good I had never experienced before. I know that the daily visualizations of seeing myself running through my week with the best possible outcome (headache free of course) gave me this confidence that what I had been visualising was of course going to happen. No doubt about it! It took away my anxiety, negative affirmations and worried self talk that would go around in my head on a daily basis, and only leave me with this unwavering faith that I knew everything would be ok! The new do looks gorgeous! Congratulations on your progress! Love the brunette locks you look so happy. Previous Entry My Fantastic Results After Only One Week of Using Dr Joe Dispenza’s Meditation CDs!